She trained in acting at the Arts Educational schools, London. Her first television job on graduating was Eastenders, followed by her theatrical debut on Londons West End with the Soho Theatre Company. Lindsey is looking forward to farting on a daily basis (apart from 12th August) at The New Town Theatre. Philip Kingscott graduated with BA Hons Performance from The University of the West of Scotland in 2009. He has since worked as an actor with various theatre companies in the UK and abroad. Philip's recent stage roles have included leads with Theatre Alba ( Saint Joan , Suddenly Last Summer , Bedtime Story ) and UK and Italy tours with Peapod Productions ( The Reindeer Monologues , The Garden , Passing Through ), plus roles with Siege Perilous, Wildworks, Tron Theatre and The Arches. Film work includes The Wicker Tree (2011, Director. Robin Hardy) and the Scottish BAFTA winning Trouble Sleeping ( 2008, Director. Robert Rae ) . In addition to the performance roles, Philip is the founder and Artistic Director of Peapod Productions. He has also taught and directed with youth drama, including currently serving on the board of Firefly Arts. As well as playing Guffy in Princess Pumpalot: The Farting Princess , Philip will also be playing Callum Patterson in Silence in Court and Conflict in Court (EmeraldBlue Productions) at this year's Edinburgh Fringe. TV work include roles in Taggart , Albert and the Lion , Winners and Losers , and A View From Harold Clark . After a successful run in 2013, Edward returns as the King in this year's production of Princess Pumpalot: The Farting Princess . He will also be appearing in Silence in Court and Conflict in Court (EmeraldBlue Productions) at the New Town Theatre. Donna also keeps busy as a principal soloist in A Song, A Sip and A Sandwich at various venues throughout Scotland and has toured with the musical comedy I Will Survive (InsideOut Productions). She is delighted to be returning as the Queen in Princess Pumpalot: The Farting Princess at this year's Edinburgh Festival Fringe. Blair Grandison is currently training in Musical Theatre at the MGA Academy of Performing Arts. Theatre Credits include Charles Brand in Silence in Court (EmeraldBlue Productions), Gary in And They Played Shang-a-Lang (Craft Theatre Productions) and Mr. Lipari in A View From the Bridge (Royal Lyceum Theatre Company). As well as playing Prince Nastavia in Princess Pumpalot: The Farting Princess , Blair will also be appearing as Brad Majors in A Virgin's Guide to Rocky Horror (EmeraldBlue Productions). Blair is thrilled to be farting with Princess Pumpalot: The Farting Princess this year at the Edinburgh Festival Fringe. Eric has been a singer and conductor with the Edinburgh Revelation Rock-Gospel Choir since 2009. He joined the Cadies Productions/LRStageworks team in 2013 in the Promotional Department, helping to promote the Edinburgh Fringe Shows as the Artful Dodger. Eric has played a number of historical characters on Edinburgh's long running Witchery Tours, including the Highlander on The Ghost & Gore Tour and William Burke on The Murder & Mystery Tour . 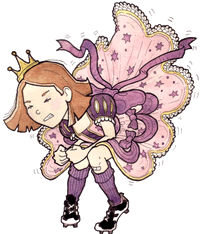 Eric is delighted to be performing the role of Prince Niceavia in Princess Pumpalot: The Farting Princess at this year's Edinburgh Festival Fringe. Scott is studying Electronic and Software Engineering at the University of Edinburgh. He first took to the stage at a young age, appearing as 'the gold-giving King' in the school Nativity Play. After this great success, Scott took a break from acting. Returning to street theatre in 2014, Scott now plays a number of historical characters on Edinburgh's long running Witchery Tours including the blue-gowned beggar William Bain and the witch Agnes Fynnie. Scott is delighted to be performing two roles in this year's production of Princess Pumpalot: The Farting Princess . He will play the leader of the Low-Flying Gnomes and will operate our extra-large giraffe puppet. Will Scott be able to be in two places at once? Let's hope so.